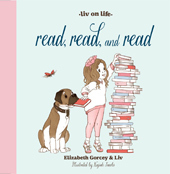 I recently had a chance to review a new Liv on Life book: Read, Read, and Read. This book was neat to read because my daughter is just about as old as Olivia, the girl who inspires the Liv on Life book series. Olivia and her mom, actress Elizabeth Gorcey (Footloose, Teen Wolf) write the books about Olivia (Liv) and her best friend Bowie, a boxer dog. Elizabeth has been enjoying Olivia's "Liv-isms" since she was three, and appreciates the perspective of a child. With the series, she encourages dialogue between parents and children, and encourages kids to find and celebrate their authentic voices. By encouraging her own daughter, she's been able to give her a voice, and realize how much adults can learn from children. The book is charming, and really helps encourage kids to read, read, and read - to find in books a world beyond the world we live in, to let imagination soar, and to welcome the adventures found in between their pages. The LOL Series has been honored with a variety of awards including the Beverly Hills International Book Awards finalist in Picture Books for Going to the Park, Purple Dragonfly Book Awards, first place for Green is Good in the category of green living and environmental excellence, Newbie Author Award from Royal Dragonfly for Going to the Park, and International Book Excellence Awards for Going to the Park as a finalist in picture books, and Green is Good as the Winner in the Green Living category. Green is Good was selected for "Great Kids' Gifts" in People magazine's holiday issue and Olivia attended the Global Green pre-Oscar party as a "Global Green Champion." Olivia also won the inaugural Gutsy Girls Educational Award. Olivia is a columnist for two magazines, Story Monsters Ink and ACT, writing her monthly columns under the banner of "Liv Says...". She is also in demand as a guest speaker at local schools, libraries, and book stores. Elizabeth and her daughter worked side-by-side creating the book series.